Jenny is in perpetual search for easy, weeknight recipes to attempt to feed her family. When they balk, she just eats more. There are many things I think about when walking sullenly through my local Soviet-era grocery store, and not all of them involve pondering the 1980’s music that seems to be the perpetual soundtrack in all American supermarkets. Just as often while shopping, as I wander, I wonder: If I buy my children their requested Cinnamon Toast Crunch, will that turn them off oatmeal and homemade pancakes? Or will it guarantee that they like me for, like, ever? Or maybe I should be like that mom at work who only allows desserts with bran? Well, I could try, but then my kids would end up like flourchild, whose macrobiotic parents didn’t appear to allow for a lot of smack talk about sugar cereals, but who then grew up into the sort of baker who offers the delightful treat Triple Chocolate Espresso Cookies. I made this cookie three times, and it is a real winner, but if I do so say myself, the best version was the one in which I made a boo-boo. 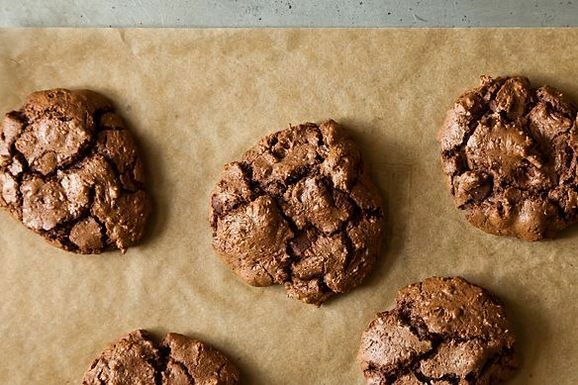 The author asks that you start these cookies off with a 12 ounce bag of chips, reserving half for the chocolate chunks to be added at the end. I forgot, and melted it all at once, yielding a supremely chocolate cookie, with a delightful espresso finish, kind of like the last sip of coffee you scarf before heading out the door for that long slog to the Metro. This is your basic cookie recipe – you are doing the creaming thing, then the dry ingredients thing, and I chose to roll my dough into little balls and then watch them spread in the oven. A little soft in the middle, but cracked on the sides is how you want these mammas to come out. If you reserve your chips toward the end, you will have that chunky fun in almost every bite, but for my taste, the fat of the cookie was sort of overwhelming without that extra melted chocolate. What chocolate you use may matter in this case, though I made this once with Nestle chips to great results. They freeze well too – a big priority for me and one you may hear more about in the coming months. If you’ve got a cookie (or other bite-sized confection) that well tolerates a few weeks in the freezer (I am mulling those cream cheese cookies from a while back that I Hoovered down by the dozen when my colleagues were not beating me to them) do let me know! I make and freeze a lot of cookies. Maida Heatter's Chocolate Chip and Almond Biscotti as well as Gourmet's Double Chocolate Walnut Biscotti (I make them without the walnuts) work particularly well. I shorten the baking time and thus they are not as hard when I freeze them. to clarify: Do you like to eat the cookies frozen? or just keep them "more for me" in the freezer for later consumption or? both? also you prefer them with the total amount of chocolate in the dough melted right? i am freezing a lot of cookies right now for a special event in a few weeks. so i will defrost them all that AM in their containers and then serve them. you can go any way you want on this, of course. Just made these delicious cookies. Easy, made a goodly number to share with a neighbor. Will definitely make these again & again. I wonder if you could add walnuts or pecans? I really liked the espresso & rum flavors. i am not a huge nut in cookie fan myself so i am not the best person to answer this, but i think pecans would probably be best bet or even peanuts. walnuts somehow dont work for me. Ok! Made them...going fast around here...and the dough that hasn't been baked is not safe from cookie monster hands and mouths. Thanks J! I am so glad you liked them. These are real winners I think and pretty quick to the oven. Jenny, I love your humor! And the cookie looks dang good, too. Whilst I have a batch of seed/coconut/flax muesli in the oven I log on to read about this evil little delight. I shall have to make them and hide them from DH who really shouldn't eat them - which really means more for me LOL. I cannot wait to bake these and thank you for the delightful reading! Well, one of my favorite songs, i wonder as i wander....now I don't need to wonder anymore about what to bake tomorrow...thanks Jenny. As a child of a mother who baked & froze baked cookies daily (we had a freezer downstairs), I can assure that 99% of cookies freeze & defrost well. I'd say meringues are the only exception (they get mushy). So, go ahead and bake to your cravings' delight: crispy, chewy, chunky, soft, frosted or not! As a grown woman, I do this myself, which allows me to keep a stash in the freezer. I can then eat just one a day, getting my cookie fix without eating the whole batch at once (which I admit I was more prone to do in my twenties). totally agree with BB here. Almost all baked cookie freeze well. I have made said cookles and they are a winner. Must try your way, Jenny. @melissav - Love Amanda's recipe. Girl Scout Thin MInts are also excellent right out of the freezer. "...kind of like the last sip of coffee you scarf before heading out the door for that long slog to the Metro." i love that you make cookies at home alone. haha, I forgot I even had that as an answer. but I am in fact home alone (sleeping baby upstairs, husband out at a meeting) and I'm baking these cookies right now! hopefully most will make it to my coworkers back at work and mourning the end of recess! Do you work on the hill????? Amanda's chocolate chip cookies (called flat and chewy or something like that) in the NYT Essentials cookbook freeze exceptionally well, so well that we always end up eating them straight from the freezer without baking them. It is a toss-up as to whether I prefer them baked or straight from the freezer. ohhhhhhhhh cookie-pop. yum. i love this thread. I also regularly roll my cookie dough into balls, plop them in a freezer zip bag, and let 'em hang out till I get a hankering (which, in my case, is pretty much every day). Nice recipe. Do you freeze them on flat surface before putting them in bags? I freeze my cookie dough balls on a baking sheet first and then transfer to a ziploc. Great to keep a stash on hand! I can't wait to bake some of these - thanks for sharing the recipe! Yum I will try those this weekend!